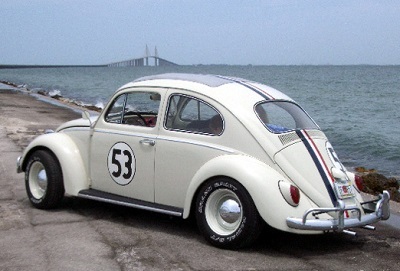 I thought it might be fun to introduce the esoterics of the Letter Q by bringing up some "coincidences" in that loveable little car from 1969, Herbie, The Love Bug. What are the basic building blocks of "the Love Bug" relative to "Herbie"? Now it is rumored that "Herbie" was given the number "53" because this was the number of the late Los Angeles Dodger pitcher Don Drysdale, however, as things just happen to always form connections, it can too be noted that the number "53" is 2/3 of the formula for the Letter Q, which is the glyph of the "fertilized egg". 1+2+3+4+5+6+7+8+9+10+11+12+13+14+15+16+17 = 153, or '53' in cipher. Hence "the Love Bug" could be seen to wittingly or otherwise accumulate and perpetuate various allegories and archetypes set into the Letter Q as "the fertilized egg". In addition, since the Letter B, which is a state of "pregnancy", can be said to have been brought about through a process of "love", it can be inferred that the woman really is "serving" the Q, or the newly conceived child. In various systems of the Mystery traditions, the "Queen" is "the goddess Isis" who is pregnant with Horus, hence the woman can be said to be serving the Queen as an act of divine purpose as set forward by Isis. Q = The Fertilized Egg. "In view of this circular form, the "|" issuing from the "O" or the egg, or the male from the female in the androgyne, it is strange to find a scholar saying -- on the ground that the most ancient Indian MSS. show no trace of it -- that the ancient Aryans were ignorant of the decimal notation. The 10, being the sacred number of the universe, was secret and esoteric, both as the unit and cipher, or zero, the circle." Suffice it to say that if we remove all the mystical obfuscations, we can simply reduce the system to a base of 1's and 0's. The VW logo encodes the number 322, or the 3 V's, which are thus 3 sixes as shown below in the Isisian Codes, which then reveals the Goddess (EVE), or 666. 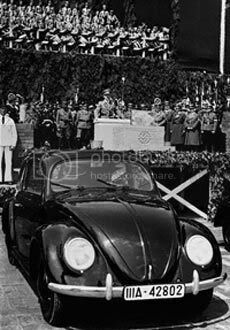 The most popular car of the Volkswagon line, and indeed, in the history of the world, is the VW Beatle. So what Occult forces and symbols are in play? 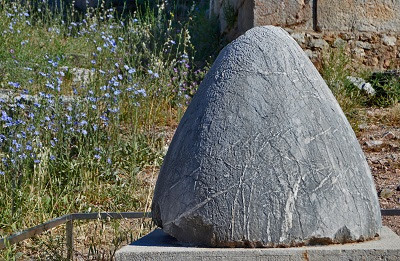 Now we may liken the two eagles sent out as being 1's and 0's, or males and females, and so "the center of the world" is really "the act of love making", for the "navel of the world" is a stone that is oft depicted as "covered in bees (B's)" as shown above. Now do you see Her B, the Fertilised Egg (Q as '53'), and the choice of a "Beatle" (betylus, baetyl)? In addition, we find that the second letter of the "kabballistic alphabet" is called "bethel", "beis", or "beit", depending upon the Rabbinical school one is studying? Perhaps now the "kabballistic significance" of the Jewish letter Beis (beit) makes more sense. But be careful how you interpret, for there are many malicious errors in the prescibed values and iterations. Notice that the Alphabet is divided into two halves. The first half goes forward from A through P, while the second half reverse from "Y" (the Child) to Q. The "center of the world", or any world for any person, is esoterically the point of conception, when the "spermatzoa" meets the "egg", where the P meets the O to formulate a Q. In each case, either forward or reverse, the Male is located at "number 1", meaning that the A as represented by the lower half of the X is at 1, or in reverse, the P, too the male sexual energy, is located at 1. The Letter B and R can be found at position number 2, while the O, as the Feminine (and too the V as V is a 5 and may be summed from 1:5 to reveal 1+2+3+4+5 = 15 = O Letter), is too second from the end if we count the P as 1 and the O as 2. So the center of the world is really where the Sacred Feminine and the Sacred Masculine merge into sexual union. When this happens, "O" as the Feminine is "married" (merge and marry sharing such obvious phonetics?) to the Masculine P, to create the Q. 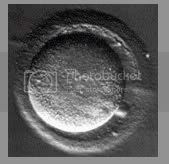 The fertilized egg (Q) is then "implanted" into B, or the profile of a pregnant woman, and after a period of "9 months", or the letters QRSTUVWX-Y, a "child", or the Letter Y, will be born. The B will serve the Q, and when the 9 months transpire, the B (water = naval = navel) will "BR-ACHE", or brake and break the same, meaning a process will stop and cease (existince in the "water = navy = naval = navel), the amneotic sack will BR-EAK, and the cries and pain of BRth will begin. The B will return to being an R, and a new strand of DNA will be born (the Letter S), which will then approach adulthood as either and O or a P and will need to then find an O or a P to start the cycle. A good test in reality perception is as follows: take the phrase "thank you", and simply understand that ultimately, it is saying "Thank Q", meaning thank that from which all life comes. The word to describe the creation of the Q is called "PAGAN", and hence its vilification and attempted obliteration. Yet the whole world is PAGAN in that all eminate from the O and the P to create the Q. Not that the above is set into a mathematically ordered sequence. 16 is male. 17 is made from the first letter of the alphabet A and the 7th letter of the alphabet G, hence 16 is P and 17 (AG) is Q, or the 17th letter of the alphabet. This is a classic case of Illuminatus encryption used by Continental Masons. Since we have 2/3 of the formula, meaning that we have the Male as P and the Child as Q, we know that the letters AN of the word P-AG-AN, must be Feminine. A+N=15=O Letter = Feminine (egg). 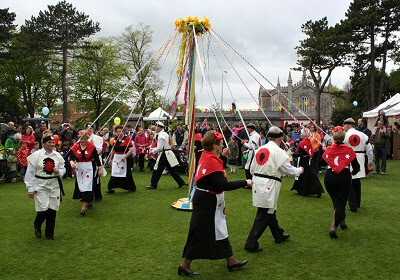 This is the secret to the Maypole. May means "you can", and POLE means "union of the sexes" in the face of a Semitic religious dogma that vilifies the whole beauty of the creation. Hence "bees" will be seen as "pol-lenators", and in this, the Bees serve the Queen and equally create the Q's of the plants and so we have the BR's and the B's or in English, the BRd's and the Bees, or the "birds and the bees" as a hidden Occult formula of "goddess worship". So the next time you are in the local supermarket, and you are standing in line: observe and synthesize the reality of the Occult genius of the phrase "Thank Q" and understand clear what is meant by the rather "solemn" and "pious" invokation that the masses know nothing about. CUP can be read as 'the C up' ergo U or V.
So I guess the moniker Ann is as it is. That is, I thought an was akin to on, like the 1 and Egyptian On. Talk about convolution. What's funny is that although the binary 1/0 is used ubiquitously, it appears that within vortex math, there's no place for the 0. Just 1-9. Now this is an integral system. I think, the place for the 0 in Vortex math is perhaps because the "0" is you. You stand at the center of "0" because of E=MC2 backwards! We create from the Void! "Something from nothing." The 0 is encompassing 1-9. You think therefor you Are.